Are you one of those CSS designers or developers that like to place your separate concerns into different tangible files? Do you make a “layout.css”, “typography.css”, and “colors.css” file for every website you create? Do you make different cascading stylesheets for each type of browser or platform that you expect to visit your website? 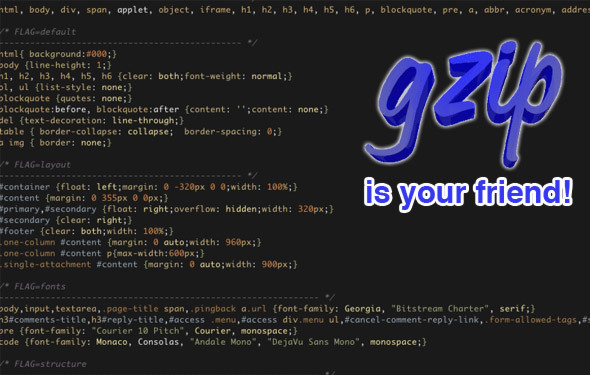 If you answered yes to any of those questions then take a look at our script here and solve your overwhelming CSS file inclusions by combining them with PHP and compressing them with GZIP! First, start by calling the CSS file, but notice that we will be using “style.php” as the filename. Well no, but you’re basically done! All you need to do now is add your CSS file (which needs to be titled “style.css” in order for the PHP script to find it) into the same folder as the style.php file, and let the script take care of the rest! If there is no browser specific stylesheet found, the script will still function – you can add or remove browser specific stuff as you see fit! So, in other words, when a user comes to your website, they will download a tiny CSS file, have it cached, and will be able to browse a fully optimized site. That means someone with IE7 can have an equal experience as someone with Safari, thanks to fully customized browser CSS – without any hacks! Here is the download – have fun and make sure to use it in all of your projects! Questions or suggestions? Tell us all about them below!